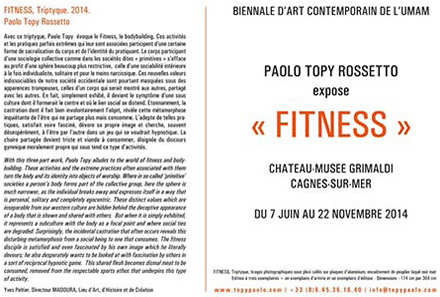 With this three-part work, Paolo Topy alludes to the world of fitness and bodybuilding. These activities and the extreme practices often associated with them turn the body and its identity into objects of worship. Where in so-called ‘primitive’ societies a person’s body forms part of the collective group, here the sphere is much narrower, as the individual breaks away and expresses itself in a way that is personal, solitary and completely egocentric. These distinct values which are inseparable from our western culture are hidden behind the deceptive appearance of a body that is shown and shared with others. But when it is simply exhibited, it represents a subculture with the body as a focal point and where social ties are degraded. Surprisingly, the incidental castration that often occurs reveals this disturbing metamorphosis from a social being to one that consumes. The fitness disciple is satisfied and even fascinated by his own image which he literally devours; he also desperately wants to be looked at with fascination by others in a sort of reciprocal hypnotic game. 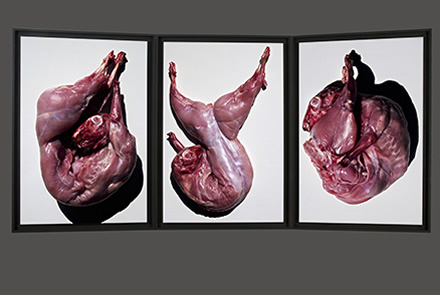 This shared flesh becomes dismal meat to be consumed, removed from the respectable sports ethos that underpins this type of activity.